It’s your first day in Key Largo. It’s hot, it’s humid, but you’re ready to play. Rather than doing what you can do in any town and going into the nearest bar, start your vacation off right with a a jet ski rental from Keys Skis Watersports. Not only are jet skis an excellent way to cruise the coast, but they offer unparalleled views of sea life and give you up-close-and-personal access to Key Largo’s lush shores. Moreover, a jet ski is a great way to get from site to site, giving you the freedom to explore on your own or with a partner — all at your own speed. Not that we think you need much convincing, but we’ve compiled our top four reasons you should rent a jet ski while in Key Largo. Ready for some marine motivation? 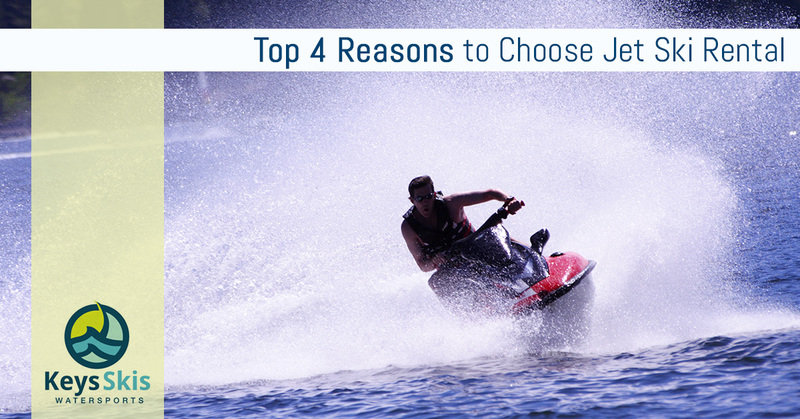 Take a peek below to learn more about why jet ski rental is a must. It’s no secret that jet skis offer some of the best me-time experiences out there — even if your me-time is shared with a partner. Having your own jet skis lets you explore Key Largo’s inland waterways, the Atlantic, and the Gulf of Mexico while zipping to and from any desired destination. Vacations aren’t about restrictions, right? This may seem a bit blatant, but what other watercraft delivers the same level of excitement as a jet ski? While we offer several other watersport rental services, we have to admit that jet ski rental has a special place in our hearts — and in our adrenal glands. If you’re looking to get your heart rate up and pack in an impressive amount of sites in one short afternoon, look no further than jet ski rental. Reason 2: . . . Exercise? Really? While operating a jet ski isn’t going to give you a six pack or blast your belly fat, it does require more work from your abdominals. Abs aside, our cardiovascular systems receive a healthy dose of stress when operation jet skis. This adds to the adrenaline rush we get when we first rev the engine and zip atop the waves. Finally, keeping your jet ski right-side-up requires our bodies work a little harder than normal (jet skis are heavy! ), thus resulting in more burned calories. And when we’re on vacation, we tend to leave our diets behind, so who doesn’t need a little extra help keeping vacation calories at bay? We don’t mean to get overly sentimental, but vacations are meant to create memories that can last a lifetime. If you’re still unsure whether or not a jet ski rental is right for you, ask yourself this: ‘Is [insert other not-as-fun option here] as fun and rewarding as a jet ski?’ Spoiler alert: no other PWC delivers as much memory-making fun as a jet ski. If you’re ready to get your vacation off to a thrilling start, choose our jet ski rental services today. Questions, comments, or concerns about our rental policies or other services we offer? Don’t hesitate to reach out to us today.